Not the best week for the Budster! Had my 3rd Birthday on Monday and I was really looking forward to it and then I got sick over the weekend. What a bummer! Wasn’t feeling too well on Monday and Mama and Daddy had to take me to the vet to find out what was wrong. I had a spot under my chin that was so itchy it was driving me crazy! Come to find out it is nothing serious, something called a ‘hot spot’. The vet says they are common with Newfie dogs and golden retrievers. She gave Mama some cream to take away the itch and put me on antibiotics. What a miserable birthday! When I came out of the vet’s office Nicholas was waiting in the car and so happy to see me, tail a wagging! He felt bad that I was under the weather and has been very gentle and kind with me all week. I started coming around quickly to my old self and when Mama and Daddy took us for a walk last night I ran and I ran (even caught the ball once on Nicholas). I had some good news while at the vet, I lost 6 pounds since my last visit earlier this spring!!! She was very impressed with me and said that’s the results of my new weight control dog food and all the swimming I’ve been doing! I’m a hero! I was beaming from ear to ear when I heard this news. Mama said she could tell I’d lost weight but Daddy was skeptical said he couldn’t see it. Mama really gave it to him! Mama had promised me a cheeseburger picnic for my birthday and although I couldn’t go out for a picnic nor invite all those I wished to join me she did make cheeseburgers for supper and Nicholas and I ate ours right up! Mmm mmm good, yummy, yummy in Buddy’s tummy! That lucky Steven is doing an open house this Saturday from 2- 4 at 7 Wheaton Lane on Belleisle Bay ($119,500). Now here is a spot that Buddy could get used to pretty easily! What’s nicer than laying out getting some R and R on a fine sandy beach with the fresh air blowing through your fur listening to the waves roll in along the beach after a nice refreshing dip in the bay with friends (or brother, this would be Nicholas)? I can just picture it now! Then wandering up the path to the camp as you follow the scent of a delicious barbeque (cheeseburgers please). I wish Steve would let me come up there to help out. I’m very good at greeting people and I could show off my dog paddle while Nicholas shows off his new dive where he runs down the beach wide open, flies through the air and dives out into the water as far as he can! It’s really something to see. A German Shephard taught him that last summer at New River. If you’re listening Steve we’re both available on Saturday but you’ll need a blanket for the back seat as we wouldn’t want to get your car interior dirty! On Sunday the Team is in Millidgeville from 2-4 highlighting that desirable area of town with its gorgeous sunny weather (very similar to the Kennebecasis Valley). Steven is at 15 Leeward Lane in Cedar Point Anchorage ($375,000), a lovely stone façade home with huge master bedroom, gazebo and water views. We are in a gorgeous home, (professional interior design straight out of a magazine) on 32 Deerwood Cres, ($489,900)near the ferry also with river views and Pam is at 78 Tudor Lane ($228,000 no condo fee) a lovely furnished garden home with natural gas heat and finished basement! Hope you have a good weekend and if you see Nicholas and I out and about in the parks, trails or on the beach please come over to say hi! We love meeting new friends, especially the four legged furry kind! (Be forewarned, Nicholas will try to kiss you!). If you see us in the parking lots waiting for Mama in our SUV come on over, you know we are super friendly and we’d love to talk with you. We got my bright red SUV (known in the family as Buddy’s truck) last year from Doug Lockhart at Brett Dealership in Saint John. What a super nice guy, Nicholas and I hit it right off with him! He has a pretty girl named Maggie ( a Westie, just like Maggie on the TV commercials) and he is the best of fathers to her. 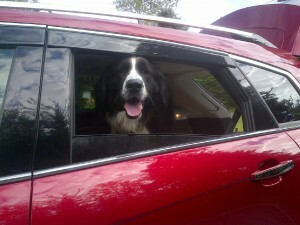 He looked right after us and fully understood our four-legged needs in a vehicle! We needed easy access, A/C and plenty of room for Big Buddy Bacon! Our brothers who are passed now, Theodore and Laddie always got their SUVs from Doug at Bretts. If you are four legged and furry and looking for a new vehicle we suggest you tell your family about Doug Lockhart. We highly recommend him! (He may even sneak you the odd dog biscuit, but keep that one on the down low). I’m getting more techy by the day! You can now follow me on Twitter! @buddybaconblog #funwithbuddy ! I’m currently following A & W Restaurants where I am so excited about their new Buddy Burger®, (was it named just for me? ), the Cineplex , as Daddy and I are such movie buffs (Mama calls us couch potatoes) and SPCA where Mama thankfully found me and Nicholas! 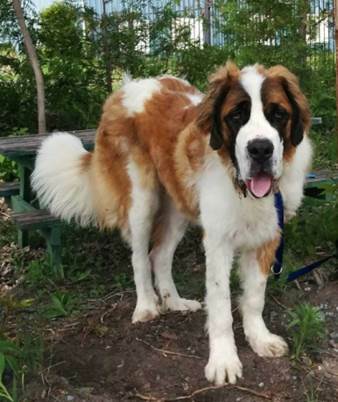 Mama had an email from the SPCA that I came from and they have another gorgeous big boy at their shelter looking for a forever home. His name is Mozart and he is a one year old St Bernard. Pic attached. I was lean like this when I was one but as you know I quickly filled out (a little too much if you listen to Dr George but that’s okay I’ve started doing a lot of swimming and Mama says she sees the difference already!) (did I hear Nicholas grown). Nicholas and I tried to talk Mama into adopting Mozart as our new brother but Daddy almost had a fit! He says two big boys is all he can handle in one house. Mama says his personality would be much like my Newfie one, very kind, gentle and loving (smile, smile). I hope someone adopts him who lives near me as he sure would be the perfect playmate for Big Buddy Bacon! Wonder if the guy can swim? If you can give a loving home to a sweet dog like Mozart just email me at Buddy@KatherineBacon.com and I’ll hook you right up. He’s going to be a big bruiser but they’re the best kind! On behalf of Nicholas, Team Platinum and myself we cordially invite you this weekend to our fabulous Fine Homes International™ Open House with four gorgeous properties open for viewing this Sunday May 24th from 2 – 4pm. They include 100 Brigadoon Terrace Millidgeville Offered at $1,380,000 with a 3000 square foot stunning stone house (high-end renovations) on 2.6 private acres of manicured waterfront with private boat launch, 35 Elizabeth Parkway, Hastings Cove, Rothesay offered at $1,320,000 with a beautifully updated 3806 square feet handsome home on ¾ waterfront acres with beach in prestigious neighbourhood, 36 Maliseet Drive, Sagamore Point, Rothesay offered at $850,000 with a top quality 5004 square foot house with chef’s dream kitchen on a 3/4 acre private lot with in-ground pool and hot tub and 5 Riverfront Crescent, Quispamsis offered at $848,000 with a custom ranch house with finished walkout basement totalling 4275 square feet on 2.6 waterfront acres with sandy beach and boat launch! If the Team would permit the Mascots to attend we would be happy to show you the great fun provided at each of these homes rather it’s swimming in the river or the pool! Mama says no way but we are still working on her! I discovered something new this week and I think it must have been named especially for me! The “Buddy Burger®” at the A & W Restaurant! I love them, 100% beef raised with no hormones or steroids, only 310 calories, so healthy for Big Buddy Bacon. Fussy little Nicholas even loves them. Mama says when she was 16 years old her first summer job was at the A & W Drive-In on Rothesay Ave (now that wasn’t yesterday, be good Buddy). She had a ball that summer, raking in tips like crazy. Her brother (our uncle Tom), was only 5 years old at the time and he’d come in for a free Baby Root Beer in a frosty mug (free to those under 6) from time to time. Wonderful memories for Mama. Steven is a busy bee with open houses. Saturday from 2 – 4pm he’s at a waterfront ranch-style at 185 McCarthy’s Point Road in Charlotte County, turn left off the old St. Stephen Hwy #175. Take the Lepreau exit #86 off Hwy #1, past New River Beach to Pocologan (before you get to Seeley’s Cove). Sunday from 2-4pm he’s in Nauwigewauk at the most scenic waterfront property you’ll ever see overlooking Darlings Island, Darlings Lake and the distance mountains of Pickwauket in Hampton. Just like something off a post card! Drop in to say hello at 479 Route 100 at this 2-storey waterfront farm house. Hope you have a great weekend and don’t forget your sunblock! You can also now follow me on Twitter @buddybaconblog . Can’t wait to try the new #buddyburger #awrestauraunts. My little brother Nicholas started school Tuesday night, he’s now a little school boy! He had already been to obedience training (Daddy’s says that a joke, Mama says he’s an angel and I say now that IS a real joke) so now he is in the Beginner class for Agility Dogs. He came home sooo excited, he absolutely loves it! We thought he would. He will learn to go over jumps, through tunnels and hoops, over bridges, etc. on a set course and it’s all timed. The fastest dog wins! My money is on Nicholas; he’s fast, loves to jump and he’s super focused! Mama says when he’s ready to go into competition that Daddy and I can go to cheer him on. Daddy has a really big voice and I’ve got a really big bark so I’m sure he’ll hear us over the entire crowd, “Woof, Woof, Woof, Go Nicholas Go!”. He has a really nice teacher named Julie who is very patient and kind and the school has a huge classroom which is spotlessly clean. Nicholas made two friends at school already, Mia and Maude. Mia is a border collie who is very smart and obedient (she even gave him a kiss after one of her rounds, I think he’s sweet on her). Maude is a poodle who is super-fast and can jump like crazy! The little guy is really going to have to bring on his ‘A’ game to keep up with these two speed demons! These classes are indoors for now but in June they will move outdoors where they can enjoy the sunshine. The outdoor classes will be in Rothesay so they won’t be too far from our house. While Nicholas is at school with Mama, Daddy takes me for a nice swim in a nearby pond. This is what makes Buddy very happy, as swimming is my favorite thing to do in the whole World! Mother’s Day is coming up this Sunday, don’t forget to roll out the red carpet for your Mother’s! Daddy is taking Mama and our Auntie Blue to the Union Club for the Mother’s Day Brunch. Our friend May says it’s going to be extra special this year but she can’t let Nicholas and I in (we begged and we pleaded to no avail). We said we’ll just sneak in the back door but May said, “No way boy’s, not on my watch!” May runs a tight ship but Mama says she’ll bring us home a doggy bag! Ha, ha, Yeah! On Saturday from 2-4pm Kim Burt is hosting an open house in a gorgeous “New Listing” custom home at 23 Cobblestone Drive in Quispamsis. This one has all the bells and whistles as well as two huge decks with water view! It’s a “Must See”! Steven will be at 25 Cameron Court in Saint John on Saturday from 12 – 2pm (note the time) in Saint John at a lovely townhouse. Don’t let the exterior deceive you from the street, this “New Listing” has a very spacious layout as you’ll see once you’re inside this open concept one-level, easy living home with convenient location. Then on Sunday from 2-4pm Steven is hosting his soon to be famous “Mother’s Day Open House with Chocolates and Roses” at 2808 Rothesay Road, Rothesay on 1.8 mature acres within walking distance to RNS and the Riverside Golf and Country Club! Let’s wish him the Luck of the Irish to repeat last year’s performance as he sold his last years “Mother’s Day Open House”, 120 Meredith Avenue, Saint John, right on the spot and all the ladies enjoyed the delicious chocolates and the beautiful roses! Drop in to say “Hello”, you’ll be glad you did! 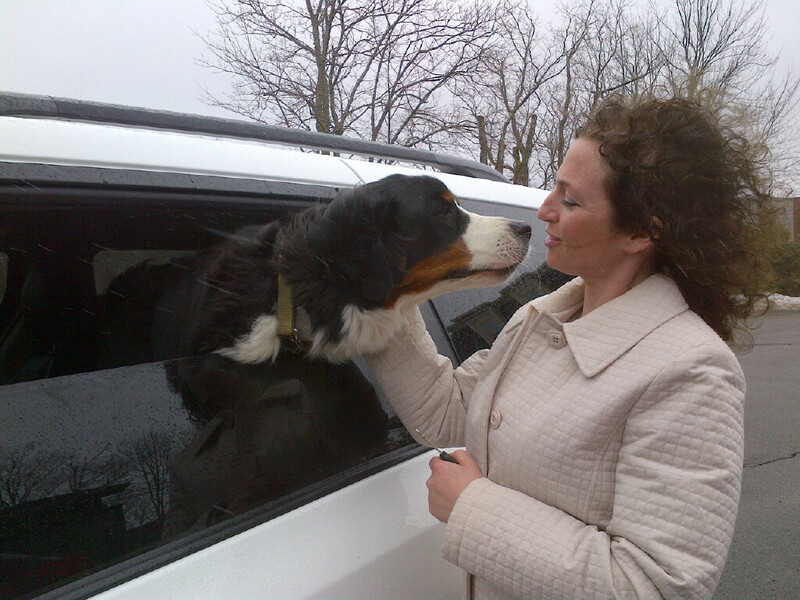 Nicholas and I met a handsome Bernese Mountain Dog this week named “Apollo” whose mother is part of our Team Platinum, Jennifer. He came by the office with her to say “Hello”. He is super friendly, has a gorgeous coat, and like us enjoys driving in the back seat of his mother’s vehicle. He’s just young but he’s already bigger than Nicholas but not as big as Big Buddy Bacon! Looks like we’ll be doing yard work this weekend getting our place all spruced up for summer. Mama says she’s going to buy a cart for me to pull as I’m built like a draft dog and could be a good help instead of her pushing the wheel barrow. Nicholas thinks he’s the strongest and he wants to pull the cart too! Border Collies, you just can’t keep them down! We’ve nicknamed him “Super Dog”, photo attached. Our new friend Apollo visits with his mama Jennifer. You can just see the love in his eyes. 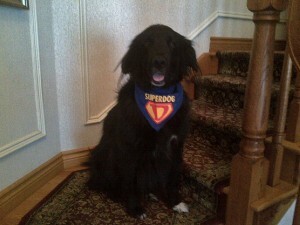 Super Dog Nicholas all ready for Agility School!